Bi Luo Chun has a gentle flavor and strong aroma with a deep green color (Bi) and the curled dried tea shape similar to a snail (Luo). In addition, it must be harvested during the early spring (Chun), which results in its white feathery appearance. While Dong Ting Mountain is an old tea producing area dating back to the Tang Dynasty (619-907), Bi Luo Chun become very popular during the Ming Dynasty (1368-1644) and later a Tribute Tea during the Qing Dynasty (1644-1911). There are many stories about how this tea was named, but the important characteristics are the deep green color (Bi), the curled dried tea shape similar to a snail (Luo). In addition, this green tea must be harvested during the early spring (Chun), which results in its white feathery appearance. There are five main fresh water lakes in China, the 3rd biggest being Tai Hu (Tai Lake) in Jiangsu Province. Within and around the lake is Dong Ting Mountain where Bi Luo Chun originates. Dong Ting actually refers to two mountains known as Dong Shan (East) seated on the eastern edge of the lake and Xi Shan (West) which sits on an island within Tai Hu. The taste and aroma varies between Bi Luo Chun harvested from these two mountains. Dong Shan Bi Luo Chun has darker and bigger leaves with a rich taste. Xi Shan Bi Luo Chun has small, tender leaves with a gentle taste. We selected the highest grade of Bi Luo Chun from Xi Shan because of its unique fruit-like character that derives from the influence of the many fruit trees that grow on the island. The fruit trees provide shade for the tea bushes and bloom in the springtime when Bi Luo Chun is being picked. This results in a mildly sweet flavor and fruity aroma being transferred into the freshly picked tea. For more on the lake that Bi Luo Chun hails from and the tea itself, we have a video that expounds more on this tea. Our tea master Lu Gen Liang had taken over the family trade early in life, after having just graduated from junior high at 16 years old. Life on the island revolves around one of two products, tea or fruit harvesting. Growing up, Lu Gen Liang was taught by his family how to skillfully pluck and tend to the tea bushes and as well as how to fire and process their fresh leaf. He has continued the family business ever since. Every hand crafted tea is distinct in the movements used for it’s shaping, and the tea master’s hands will reflect those differences; for instance where callouses have developed from touching the hot wok or leaves. Bi Luo Chun’s curled shape occurs right after the frying process when the tea master will scoop hot leaves into his hands and roll them along his palm and fingers; resulting in callouses all along his hand. This is different from other traditionally hand fired teas, such as Dragon Well green tea, which will leave a callous along the top of the palm from pressing the tea leaves in the wok. 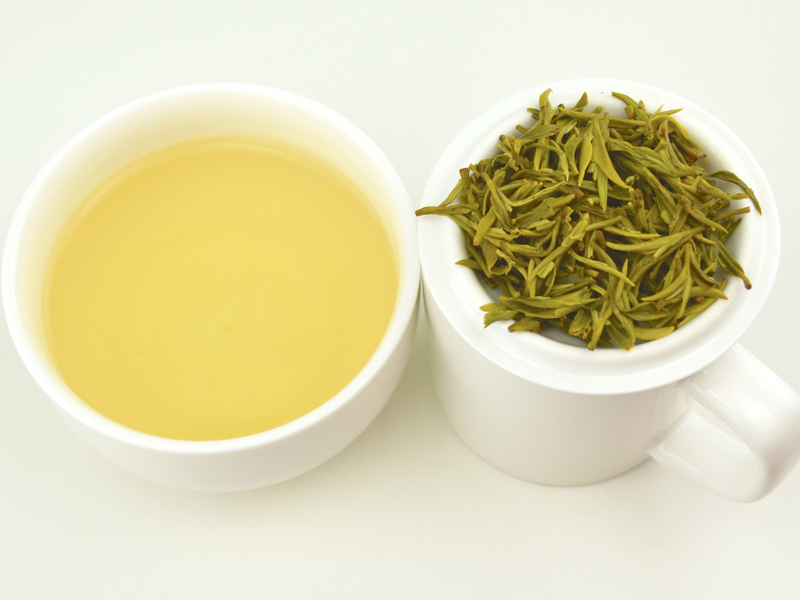 Bi Luo Chun is one of the earliest picked green teas. It is normally plucked near the end of March while the weather is still cold. Tea pickers will dress in winter clothes wearing gloves with the fingertips removed so they can still effectively pick leaves. Mr. Lu is more often than not roaming around with his tea picking staff early in the morning to ensure the proper timing and quality for every picking. He will instruct them to closely inspect each individual bud waiting for the idea time, when the first leaf barely begins to separate from the full sized bud. Mr. Lu collects all of the fresh leaves from the tea pickers when they return for lunch at his house. He will then gently lay the fresh leaves along bamboo trays to allow them to dry for one to two hours, depending on the moisture in the air. While the tea is breathing he will prepare his wok for frying. Once the tea leaves have the appropriate flexibility to the buds, without them being so crisp they snap the tea leaves are ready to be fried. Mr. Lu will spend the better portion of his day frying tea leaves. First he will use a very high temperature in the wok to fry the tea leaves and destroy the enzymes and preventing oxidation, then he will lower the temperature to continue frying while working one handful of leaves at a time into their proper shape, repeating the hand rolling step until the tea leaves are nearly dry while adjusting the temperature. There are only about 300 grams of tea leaves per frying session in the wok at one time. After the tea leaves are their curled shape he will give the leaves time to rest before returning them to the wok for the final frying to bring the tea leaves to their desired moisture. Later in the evening, after all of the fresh tea has been fried Mr. Lu will bag the fried leaves in local paper before putting the packages in plastic bags; they will then be stored in tin buckets containing limestone along the bottom which will help absorb excess moisture. Since this tea is picked so early in the spring the dry tea leaves are coated in small white ‘hairs’, which is customary for high end Bi Luo Chun, the fuzzy and very small leaves are characteristic for this tea. There are machines that can remove or reduce the fuzzy hair of the leaves, however traditional Bi Luo Chun contains no such method. Bi Luo Chun is a tea best enjoyed as early as possible in China, to experience the freshness of the tea with the unique characteristics and aroma the blossoming fruit trees provide. Unfortunately, it is common for substandard teas to be labeled and sold as “authentic” Bi Luo Chun. Identify authentic Bi Luo Chun by its fresh but gentle flavor and its rich aroma that is stronger and more complex than common green teas. Hiking to the tea garden on Dong Shan island, inside of Tai Lake. Tea bushes grown under many fruit trees, receiving shade, also getting a nice aroma from flowers during early spring. Many loquat trees surround the tea bushes. Early spring fruit blossoms surrounding Bi Luo Chun tea garden. Tea farmer Lu Gen Liang has been creating tea since he was 16 years old. Zhuping with Bi Luo Chun's tea producers. This family has been making traditional tea for three generations. It is always raining during early spring, so tea pickers wear raincoats and bring a small basket to pick only buds and 1 tender leaf for Bi Luo Chun. In this village, people still do their laundry in the river. The traditional way to remove humidity from tea is using limestone covered at the bottom of a bucket to absorb moisture.